The Linyanti area is fascinating for its geography. Movements in the Earth's crust mean that rivers can disappear and flow again independently of good rainy seasons. It is also renowned for the number of Elephants which pass through the area in the winter months and the world's second largest Zebra migration. This is the north-eastern area of the Okavango bordering on the Chobe National Park. The Linyanti ecosystem and the Chobe ecosystem are interconnected, and provide a pathway for large numbers of wildlife between the Okavango and Chobe.This is a 1250km reserve between the Khwai Area and the Mamili National Park where the Linyanti Swamp is. The Linyanti River flows out of the Linyanti Swamp. 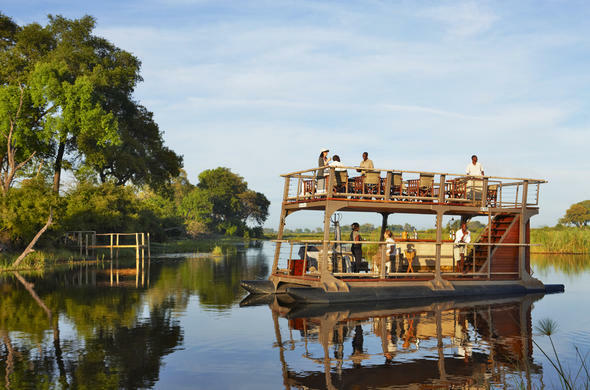 The Linyanti is an essential part of the Okavango experience, so you can see the contrast between the wetland areas of the inner Delta and the desert areas on the fringe.The Linyanti region is dominated by the Savute Channel and the Linyanti River. The Savute Channel is a very interesting river as it may dry up for over 20 years at a time, before flowing once more. This is because the source of the river lies on a fault line in the Earth's crust. If there is movement in the Earth's crust, the flow of the water may be cut off.The channel dried up in 1980 and the area became dry grassland and reverted to desert scrubland. Many lodges in the area put in boreholes as the river dried up. These waterholes were lifelines for the animals in the region, and vast numbers gathered in the dry season.When the river started flowing again in 2008 the area became green and lush once again, and the river now provides water for the animals moving between the Chobe Game Reserve, the Savute Marsh and the oasis that is the Okavango. Two thirds of the Savute channel is located in the Linyanti Concession. The Linyanti region is made up of different types of woodland habitats and ancient floodplains that are covered with savannah. Since the river started flowing again, many of these are now very wet regions. The Linyanti River is bordered by lush riverine habitats and these are home to a wide variety of animals. These forests are made up of Knobthorn, Leadwoods and Rain Trees. Further away from the river the bulk of the area is made up of Mopane woodland which is dotted with the occasional Baobab. One of the main attractions of an Okavango safari in this region is seeing the highest density of Elephants in the world during the dry winter months. From June to September vast herds of Elephant that can number in their thousands move through the area. Zebra also migrate through the region in search of water during this period.Many Wildebeest, Impala, Southern Giraffe, Eland, Lechwe, Reedbuck and Kudu can also be seen year round in this area of the Delta. In the dry season you may also see rare antelope species such as Sable and Roan Antelope. Small groups of Elephant and Buffalo can be seen year round.There are also numerous Hippos in the Linyanti River, and a game viewing river cruise is a wonderful way to see them. This is one of the few places in Botswana where you can see Waterbuck - they are common in the wetter areas of the concession.Smaller animals in the region include Vervet Monkeys, Chacma Baboons, Warthog, Serval, Large Spotted Genets and Lesser Bush babies. As this concession is drier, you may see many more desert dwelling animals such as Aardvark, as well as African Wildcat and Caracals. There are also many predators and there is a healthy population of Lion, and Spotted Hyena. The region is also home to Leopard, Wild Dogs and Cheetah. The Linyanti Concession is an internationally recognized Important Birding Area (IBA), and the birding is excellent, making it one of the biggest attractions on an Okavango safari. The region has many different habitat types which make it suitable for a wide variety of birds. In the riverine forest along the Linyanti River you will find birds such as Swamp Boubous, Collard Sunbirds, White-rumped Babblers, Hartlaubs Babbler, Allen's Gallinule and Schalow's Louries.In summer you'll see Carmine Bee-eaters along the river banks as well as Thick-billed Cuckoo's and Narina Trogons. You can also see Racket-tailed Rollers, Bradfields Hornbills, Bennett's Woodpeckers and Arnott's Chat's. In the dry grassland areas, you may see Kori Bustards, Ostriches and Secretary Birds.The region is home to many raptors including Bateleur, Tawny, Martial, Black-Breasted Snake Eagles and Fish Eagles. Gymnogenes are commonly seen and in December you will often see Wahlberg and Steppe Eagles. You may be lucky enough to see Giant Eagle Owl's.Numerous waterfowl can be found in the swamps and lagoons along the Linyanti and Savuti Rivers. These include the rare Slaty's Egrets, the more common Black Egrets, Rufus Bellied Herons and Long-toed Plovers. It is also a good area to see Wattled Cranes and African Rails. African Skimmers are also commonly seen. The animals in this region concentrate around the waterholes in the drier winter months, so that is when game viewing is at its best. Though that is not to say you won't see any game during the wet season, and the birdlife in summer is spectacular. You have to fly into the camps in the area as self drives are not permitted. The activities in this area focus on day and night game drives. You may also go on guided bush walks which allow you to really get a feel for the region. You can also enjoy fishing on a catch and release basis.